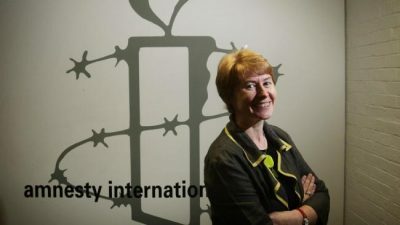 The perfidious role of ‘human rights’ organizations in the war on Syria has been exposed again with the Amnesty International report on Syria for 2017/18, followed by an equally tendentious article in the Melbourne ‘Age’ newspaper by Claire Mallinson, Amnesty’s national director for Australia. In the name of human rights these organizations have actually worsened the crisis in Syria. They have never dealt honestly with its primary cause, the determination of the US and its allies seven years ago to destroy the government in Damascus, as part of a bigger plan to destroy the Iran-Syria-Hezbollah strategic axis across the Middle East. Democracy, human rights and the best interests of the Syrian people were never on the agenda of these governments. They were cold-blooded and remorseless in what they wanted and the means by which they sought to get it. By calling violent armed groups ‘rebels’ and ‘the opposition’, these ‘human rights’ organizations conceal their true nature. By calling the Syrian government a ‘regime’, instead of the legitimate government of Syria, representing Syria at the UN and representing the interests of the Syrian people, they seek to demean it. By accusing it of carrying out indiscriminate attacks on its own civilian population, on the basis of what they are being told by their tainted sources, they seek to demonize it. By accusing it of carrying out chemical weapons attacks, without having any proof, they perpetuate the lies and fabrications of the armed groups and the governments that support them. Behind the mask of ‘human rights’ these organizations are promoting the war agenda of western and regional governments. Some are worse than others. Human Rights Watch might as well be a formal annex of the US State Department, but they all play the same duplicitous game. East Aleppo is the template for what we are seeing now in the outrage over East Ghouta, the district on the outskirts of Damascus in which hundreds of thousands of people are being held hostage by takfiri armed groups. Aleppo was infiltrated by these groups in 2012 and the eastern sector of the city gradually taken over, as the army was already too hard-pressed on other fronts to stop this happening. Until then Aleppo, a commercial, multi-religious and multi-ethnic city, had managed to stay out of the war but now it was sucked right in. There was nil support in Aleppo for the takfiris but they had the guns and they were ready to kill to get their way. Advancing on government held positions, they devastated the old centre of the city with their attacks. Digging tunnels, they blew up some of its most famous buildings. Art architecture, history, meant nothing to them. They destroyed the square minaret of the Umayyad mosque and their attacks led to the destruction of the ancient library in the mosque and the massive destruction of the Aleppo souk, one of the oldest and most colourful markets in the world. In the districts they controlled they ruled by terror, massacre and murder and the institution of the most repressive sharia laws. Under the secular Syrian government, women and men have the same rights before the law, under the takfiris women have no rights that are not granted to them by men. They sought the extirpation of all those they did not regard as true Muslims (Shia and Alawi amongst others): one of their earliest acts was the kidnapping of two orthodox Christian prelates, never seen alive again. It was these armed groups and the foreign governments behind them that were responsible for the dire situation in #East Aleppo, yet it was the Syrian government, the ‘regime’ as they chose to call it, that was blamed by the media and ‘human rights’ organizations. The White Helmets, embedded with these groups, and funded by the same governments which had armed and financed them, were used as the main propaganda prop. Their staged rescues filled the pages of the corporate media. They were effectively canonised by George Clooney, the documentary on their bogus bravery and sham rescues winning an Oscar award, unfortunately not for bad acting, which should have been the prize. As the Syrian military, with Russian air support, began to squeeze these groups in East Aleppo, the propaganda was turned up accordingly. The ‘siege’ of East Aleppo was no more a siege than the ‘siege’ of East Ghouta. The people trapped in East Aleppo were being held hostage, as are the people in East Ghouta, by some of the most violent groups on the face of the earth. These trapped civilians were their trump card. Those who tried to leave, they killed, just as the takfiris are killing civilians trying to get out of East Ghouta. Having negotiated the peaceful removal of the takfiris from East Aleppo, along with their families and camp followers, the fall-back position of the media and the ‘human rights’ organizations was to accuse the Syrian government of their forcible displacement. They made no mention of the captive Syrian soldiers whom the takfiris paused to massacre before they left. They made no mention of the civilians killed by the takfiris as they were trying to escape and no mention of the dancing in the streets, literally, by the people of Aleppo, and the honking of car horns in jubilation, as these killers were sent on their way. This just didn’t fit in with the narrative the media and these organizations had been spinning. The takfiris fight among themselves over territory, power and money but their ideology is the same, based on the destruction of the secular state and society and the imposition of a harsh pseudo-Islamic regime in which women would be reduced to the status of cattle and all Shia and Alawi extirpated. It is they who target civilians deliberately. In Adra, at the Northern end of Ghouta, they slaughtered dozens of men, women and children in 2013, beheading some and pushing others into a bread oven. In 2015, in Douma, they put men and women into cages as hostages, to deter possible advances by the Syrian army. They are shelling the centre of Damascus every day, killing civilians, including many children, including some recently mortared in their classroom. In its report on Syria for 2017/18 Amnesty International (AI) continues its misleading narrative on the fate of East Aleppo and east Ghouta. Those who support it financially should perhaps be considering where they could put their money and their good intentions to better use. AI refers to districts in east Ghouta controlled or ‘contested’ by unspecified ‘armed opposition groups’ and repeats the canard that the Syrian government carried out the chemical weapons attack on Khan Shaikhun in April last year. (Bear in mind the recent statement of US Defence Secretary Jim Mattis that the US had no evidence of the Syrian government using sarin, the agent allegedly fired into Khan Shaikhun.) AI has no proof of this, so why would it state this as fact, except to do more propaganda damage to the Syrian government? AI refers to 400,000 people ‘besieged’ in East Ghouta by the Syrian military, when the true state of affairs is that their districts have been infiltrated and that they are being held hostage by extremely violent armed groups. They are besieged from within by these groups, penned in and unable to leave except at the risk of being killed by their captors. The Syrian army is not imposing a siege, it is trying to break it. The Syrian government is accused of depriving these people of access to medical care and basic necessities, when it is one or another of these armed groups, over the years, that has caused the breakdown of efforts to set up humanitarian corridors. Even now the Syrian government is waiting with medical care, buses and accommodation but those civilians who try to leave are being shot at and killed, as they were in East Aleppo. AI’s references to ‘forced displacement’ from East Aleppo, and the way the ‘armed groups’ there were ‘compelled’ to surrender and negotiate a deal that ended the ‘unlawful siege’ are a grotesque distortion of reality. What was unlawful about the situation in East Aleppo was the presence of the armed groups, what was unlawful was the money and weapons being provided to them by outside governments, in breach of international law, what was unlawful was their killing of civilians and the restriction of their free movement (out of East Aleppo), what was lawful was the finally successful attempt of the government of Syria to break the hold of these groups. Following the release of the AI report on Syria, Claire Mallinson, the national director of AI for Australia, charged into print under the heading of ‘Australians Need to Act on Syrian Monstrosities’ (the Melbourne Age, March 1, 2018). Her reading audience would already have been won over as the Australian media has not reported the war in Syria at all but simply pumped out the same propaganda appearing in the US or British press. Others watching Syria closely over the years know what these ‘monstrosities’ are, and they are not the same as Ms Mallinson’s. These monstrosities begin with the conspiracy, of the US, Britain, France and their regional Middle Eastern allies, to destroy the Syrian government, and thus strike a deadly blow at the Iran-Syria-Hezbollah strategic alliance, whatever the cost to the Syrian people and whatever their aspirations. They move on to the use by these governments of takfiri proxies to do their dirty work in Syria, following the refusal of Russia and China to allow the UN Security Council to be used as the fig leaf for an air war. These governments armed and financed these groups. They did not care who they were, where they came from and what they believed as long as they were prepared to pick up a gun and bring Syria to its knees. These are the master criminals in Syria. The monstrosities include a media picking up where it had left off in Iraq. It had peddled the lies there, it had peddled them in Libya, it peddled them again in Syria and it is still peddling them. They include the illegal presence of the US in Syria, its killing of Syrian civilians and its attacks on the legitimate armed forces of the Syrian government and people, attacks in which Australian aircraft have shamefully taken part and which have taken scores of lives of Syrian soldiers. All of this has led to the grand monstrosity, the large-scale destruction of Syria, involving the loss of life of perhaps 400,000 people and the flight of millions of others beyond Syria’s borders. But now the same governments and the same media that brought you this war, and the same ‘human rights’ organizations that have supported it with their one-sided moralising and unbalanced reports, are expressing their outrage at the suffering in East Ghouta, as if this had nothing to do with them. The monstrosities in the eyes of the Syrian people, if not in the eyes of Ms Mallinson, are on a par with, if not worse than, the genocidal decade of sanctions which preceded the attack on Iraq in 2003 and the crimes which followed this attack, committed by the same governments that are responsible for the onslaught on Syria. The suffering in East Ghouta is terrible and outrage is justified, but it is the causes that need to be identified and they do not include the efforts of the Syrian government and army to defend the country against attack fomented from without. Ms Mallinson’s monstrosities are of a different order. They include the chemical weapons ‘reportedly’ being used ‘again’ by the Syrian government against its own people. This smear has been played out time and time again by ‘activists’ knowing that the media and ‘human rights’ organizations will snap it up. There is no proof of any chemical weapon attack ever being carried out by the Syrian military, as against abundant evidence of such attacks planned and carried out by the takfiris over the years, including the attack around Damascus in August, 2013. Ms Mallinson refers to a UN report that Syria is developing chemical weapons ‘with the help of North Korea’, neatly tying in the two demonized targets of the US government. This is another canard, originating in Washington and designed again to smear the Syrian government and to set it up for whatever might come next. What she does not say is that this ‘report’ remains unpublished, that the authors are unknown, that what we know of it comes from an account in the New York Times, which sold the lies on Iraq and has promoted the war on Syria from the beginning. The detail it gives of the material allegedly coming from North Korea indicates that it could have no possible connection with chemical weapons, which Syria does not have anyway, having given them all up under international supervision. Given the completely tendentious nature of this account, why would Ms Mallinson want to raise it except to further blacken the name of the Syrian government? She refers to the ‘warring sides’ in East Ghouta as if both are legitimate when only one is, the government of Syria. The other is a collective of extremely violent armed groups sponsored by outside governments, in breach of international law. The presence of US and ‘coalition’ forces in Syria is a standing violation of international law and their killing of Syrian soldiers and civilians a gross aggravated violation of that law. The only legitimate armed forces in Syria are the Syrian army, which has lost tens of thousands of young men defending the country, and those forces the government has invited in, from Russian air power to Iranian and Hezbollah ground forces. Ms Mallinson’s monstrosities include the hundreds of thousands of ‘ordinary men, women and children’ she says are at risk of annihilation by the Syrian army’s ‘siege’ of East Ghouta. In fact, the central source of the risk to the people of East Ghouta is not the Syrian government but the armed groups holding them hostage. The ‘siege’ is not of the people but of these groups. The Syrian military is trying to break their grip, as any army would in any comparable situation. Ms Mallinson accuses ‘the Russian-backed Syrian regime’ of breaking the ceasefire, ignoring the evidence that the takfiris are breaking it and killing civilians attempting to escape their grip. Only in the past few days they shot at a family trying to leave, killing the parents and shooting at the children even after they reached a Syrian army checkpoint. They are pouring shells into the centre of Damascus every day. There are no references in her account to the ‘American-backed’ or ‘Saudi-backed’ armed groups that have created this hell on earth, as she refers to it. Finally, she appeals to the Australian government, as it assumes its seat on the UN Human Rights Council, to ‘show leadership’ in bringing these ‘abominations’ to an end. The problem here is that the Australian government is part of the problem. It fully supports US policy in Syria and has taken part in armed action in Syria, in violation of international law. In September, 2016, its aircraft joined a US-led air attack near Deir al Zor which killed perhaps 100 Syrian soldiers and allowed the Islamic State to regain lost positions. Australia did not apologise for its participation in this outrage, only repeating the US line that the attack was a mistake, which clearly it was not. When the Australian delegate did take his seat on the UN Human Rights Council, he merely echoed US policy, by attacking the Syrian ‘regime’ and its Russian backer. If Australia does have a role in Syria, a moral role, a legal role, an independent role, it should not be as a sounding chamber for the US. It should distance itself from the illegal actions of the US and the violence of the takfiris against the Syrian people, their government and their army. It should be supporting the attempts of the government in Damascus to restore its authority over the whole of Syria and not supporting the attempts of the US and behind it, Israel, to break it up. It should support the Syrian people, not the actions of governments which have devastated their country. 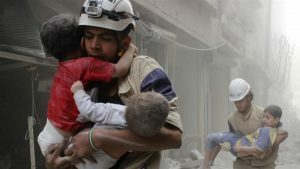 It should define policy on the basis of the causes of the situation in Syria, not how they are being misrepresented in the media, by ‘activists’ embedded with the takfiri groups, by the Syrian Observatory of Human Rights, by the White Helmets and by deluded or wilfully dishonest ‘human rights’ organizations playing politics, not serving truth, justice and the interests of humanity. This would be a credible role for Australia, an independent role, but it is not one the government is going to adopt. Everyone should be concerned at the loss of life in East Ghouta. Ms Mallinson does not have a mortgage on morality and empathy with human suffering. 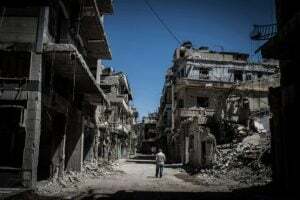 How does anyone think Syrians feel about this, Syrians shelled in the heart of Damascus every day, Syrians who have lost fathers, brothers and sons in this conflict, Syrians whose relatives are trapped in East Ghouta or have been killed by the armed gangs holding the whole region with a knife to its throat? Does anyone outside seriously think Syrians want to live under their rule? Syrians know what they want, without equivocation, the purging of these gangs from their midst, whatever it takes. They fully support their army and their government. It is their interests Australians, or anyone else of good faith, should be supporting, not the highly politicized interests of Amnesty International. Outrage is going to solve nothing: it only serves as the pretext for taking the war to a new level of destruction. The roots of this violence are clear: the decision of outside powers to destroy the Syrian government, their support for violent armed groups committed to an ideology destructive of every value these governments are supposed to represent and their refusal to allow the war to end. For the violence to end these are the roots that need to be acknowledged and torn out. Featured image is from News Limited.